22in crate = 23in x 13.75in. x 16in. 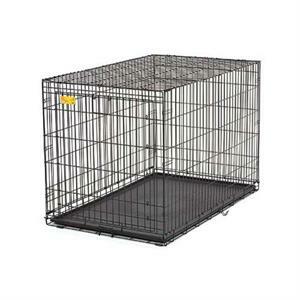 24in crate = 24.50 in x 17.50 in x 19.60in. 30in crate = 30.50in. x 19.60in. x 21.25in. The locking handle allows you to easily and conveniently operate the door in one motion without kneeling or bending. Simply lift to unlock, and swing the door open. As you close the door, just lift, position the door against the crate, and lower the handle into the eyelet latches. Secure the handle in the down position to lock the door. Life Stages ACE sets up in seconds and folds down flat for travel and storage. Detachable handles clip easily onto the folded crate for carrying. The pan stop secures the durable plastic pan, which can be removed for cleaning, and the rubber feet protect surfaces and floors. The divider panel is easy to install and can be used to adjust the size of the living area in the crate while your puppy grows into his adult size home. Life Stages ACE is backed by a one-year manufacturers warranty and award-winning customer service team.